Bowen, C. (2011). Controversial practices in children's speech sound disorders. Retrieved from http://www.speech-language-therapy.com/ on [insert the date that you retrieved the file here]. ‘Oral Motor Exercises are non-speech activities that involve sensory stimulation to or actions of the lips, jaw, tongue, soft palate, larynx, and respiratory muscles which are intended to influence the physiologic underpinnings of the oropharyngeal mechanism and thus improve its functions. OMEs may include active muscle exercise, muscle stretching, passive exercise, and sensory stimulation.’ Arvedson, Clark, Frymark, Lazarus, Lof, McCauley, Mullen, Schooling & Strand (2007). Arvedson, J., Clark, H., Frymark, T., Lazarus, C., Lof, G., McCauley, R., Mullen, R., Schooling, T., & Strand, E. (2007, November). The effectiveness of oral-motor exercises: An evidence-based systematic review. Paper presented at the annual convention of the American Speech-Language-Hearing Association, Boston, MA. ‘Some of the early 19th-century therapies used by public school clinicians have gone out of fashion. These include stuttering therapy methods to "educate the emotions" and methods involving visual and auditory imagery. Other methods, such as those involving exercises and drills, are still in common use. Exercise therapies then and now include practice in breath control, exercising the speech articulators (called speech gymnastics by our ancestors), relaxation therapies, practicing slow articulation, and working with speech rhythms (Nemoy & Davis, 1937; Schoolfield, 1937). Today, the oral-motor therapies designed to exercise the speech musculature (e.g., Rosenfeld-Johnson, 2001) have come under scrutiny. That is, they have been criticized because they are not passing the historically new standards arising from evidence-based research (e.g., Lass & Pannbacker, 2008). Duchan, J. F. (2010). The Early Years of Language, Speech, and Hearing Services in U.S. Schools. Language, Speech, and Hearing Services in Schools, 41(2), 152-160. Lass, N. J., & Pannbacker, M. (2008). The application of evidence-based practice to oral motor treatment. Language, Speech, and Hearing Services in Schools, 39(3), 408-421. Nemoy, E., & Davis, S. (1937). The correction of defective consonant sounds. Boston, MA: Expression Company. Rosenfeld-Johnson, S. (2001). Oral–motor exercises for speech clarity. Tucson, AZ: Innovative Therapists International. Schoolfield, L. (1937). Better speech and better reading. Boston, MA: Expression. Principled, ethical therapy is about theoretically-defensible, evidence-based practice and the best possible outcome for each client. That means there has to be as solid a scientific basis as possible, based on well-grounded theory and good quality research, for any approach, technique or "tool" to be used in therapy. Exercises for the mouth, or what some Speech Language Pathologists Speech and Language Therapists call "oral motor exercises", "oral motor therapy", "oral placement therapy" or "oro-motor work", are, in some clinical settings, a prominent component of intervention for children with speech sound disorders. The activities may include sucking thickened drinks through straws; blowing cotton balls, horns, whistles and windmills; chewing and mouthing plastic and rubber objects; licking peanut butter and other foods from around the mouth; and playing with "oral motor tools and toys". It sound like these mouth exercises might be fun. Common sense dictates however that children in therapy are not there to see highly trained speech-language pathologists / speech and language therapists to be entertained or simply for the fun of it. Are oral motor exercises, implemented systematically, necessary or helpful in the treatment of speech disorders? Do they contribute ANYTHING to speech progress? Is there scientific evidence to support the testimonials and claims of success with the oral motor therapies that appear in non peer reviewed literature and wherever the associated publications, and tools and toys, are marketed and sold? Is there a solid theoretical foundation for their use? And indeed what does the research literature say? Speech-Language Pathologists / Speech and Language Therapists who work with children often have a delightful "equipment cupboard" full of entertaining toys and games that children know and enjoy, as well as less familiar games specifically designed to facilitate therapy outcomes, such as card games, Chipper Chat, magnetic fishing games, Smart Chute and Word Flips. The games and toys themselves have not been scientifically "evaluated", but the procedures that they are used for very often have. For instance, the empirically tested Minimal Pair Therapies are usually presented in the form of card games and activities with toys and musical instruments. Like the Minimal Pair Therapies other therapy aproaches and their procedures are presented to children in the form of play; for example games are incorporated into Cycles Therapy (the Patterns Approach). This can sometimes involve highly structured play with rules. Board games, card games, puzzles, hide and seek and "I spy" type games, following the conventional rules, may cleverly incorporate a therapy goal or target. For example, child, parent and therapist may play a board game with pictures of "therapy words" (e.g., words ending with the "k" sound) that everyone has to say before they can take a turn in the game. By contrast, play can also sometimes appear to have little structure and few rules. Pretend tea parties, construction toy games, car races, and "free play" might be used as opportunities for adults to model target sounds, words or language structures (e.g., question forms) repeatedly. Oral play: a way "in"? Let's take it as a "given" that practising non-speech movements (sucking, blowing, chewing, biting, tongue waggles, etc) will not impact on speech. But, sometimes, with very young or reluctant children who are cautious about participating verbally, the therapist will encourage "oral play", "experimenting with the articulators" and "exploratory sound play". This is done as a sort of lead in to working on speech. What is more, it is often the only way "in" with reticent or apprehensive little children. This oral play is presented as a fun thing. The child is encouraged to watch, imitate, and gradually become a little braver (and more co-operative). Vocalisations are quickly added, and these vocalisations are turned into meaningful vocabulary as soon as possible, and at syllable level if possible, - even if the vocabulary is only "hi", "me", "no", "ta", "bye" and "boo!" at first. As soon as the child is willing or able to talk in sessions, the oral play, having served its purpose, is reduced to almost nil (if it is still fun) or phased out altogether. Brief, low-key, fun, oral play as a communicative temptation, applied early in therapy is not the same as the systematic implementation of unnecessary, time-consuming and hierarchical non-speech oral motor therapies. This sounds so obvious, but in order to improve speech you have to work with the child's speech. This means helping the child to hear and say sounds, syllables, words, and longer utterances. There are many evidence-based therapies for children's speech sound disorders that speech-language pathologists are uniquely qualified to administer. But surely children with cleft palate benefit from OMEs! No, actually they do not. Do children Down syndrome need OMEs? No, it is the same story for all children with speech sound disorders. Oral Motor Exercises are unnecessary, innefective and time-wasting for any child with speech difficulties. If the goal is to improve speech work on speech! The so called ‘Apraxia Diet’ is advocated because, Kate Welder claims, 'children with apraxia and developmental issues have special nutritional needs'. 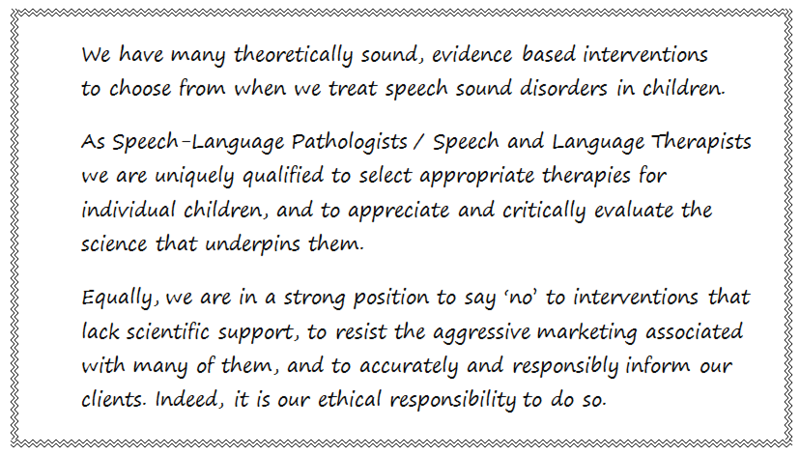 This claim is not supported in the research into Childhood Apraxia of Speech / Developmental Verbal Dyspraxia, and the sources quoted on the Apraxia Speaks web site have little, if any, authority. Nourish Life SPEAK from Speech Nutrients, with 'important nutrients needed for normal and healthy speech and coordination', results from Mark Nottoli's business endeavour. Interestingly, "Mark has a knack for product development and package design. He enjoys studying the latest developments in the world of nutrition, dialoguing with leading researchers and translating scientific developments into tangible, beneficial products." Browsing the Speech Nutrients site led to Mark's colleague Roy Bingham. As neither Nottoli nor Bingham are paediatricians it is puzzling to read that SPEAK (the name and the packaging seem to vary from site to site) is "pediatrician formulated". "Formulated and patented by a pediatrician and noted researcher, the speak™ formulation includes seven nutrients in servings and ratios determined to be most effective. SpeechNutrients speak™ contains concentrated, ultra-purified omega-3 in addition to efficacious amounts of two forms of vitamin E. Omega-3 supports a healthy inflammation response while working synergistically with the antioxidant vitamin E to reduce oxidative stress. Optimal amounts of both d-alpha and gamma tocopherols function as key antioxidants and operate with omega-3 fats to support neurological health and provide essential nutrition. Due to the theoretical blood thinning effects of omega-3 and vitamin E, vitamin K (a normal and healthy blood clotting nutrient) is also included. This precise combination of pharmaceutical grade ingredients is delivered in a convenient 2-capsule serving resulting in greater ease of use for parents and children." NutriiVeda is promoted by CHERAB through a web site, a book entitled "The Late Talker", a heavily edited discussion group and a vigorous media campaign. Readily available on the Internet, NutriiVeda is also sold as Deepak Chopra’s Zrii label ‘weight loss shake’ (same formula! ), for ‘conditions such as autism, apraxia, speech delays and impairments, Traumatic Brain Injury, global delays and seizure disorders’. These claims smack very much of snake oil, and you don't have to be a scientist to find them difficult to swallow. The claims surrounding NutriiVeda are wide-ranging. For example, 'Anecdotal reports of surges for those with autism, apraxia and other speech impairments, ADHD, Traumatic Brain Injury, seizure disorders, epilepsy and global delays in the following areas typically within just a few days on NutriiVeda: SPEECH articulation, complexity and sophistication of sentence structure LANGUAGE better understanding of written and spoken word, development of better reading and writing skills...' more here. In 1994, the ASHA Subcommittee on Auditory Integration Training (AIT) concluded that AIT, a method proposed for treating a variety of auditory and nonauditory disorders, was experimental in nature and had not yet met scientific standards as a mainstream treatment. The Auditory Integration methodologies referred to in the 2004 Technical Report included the Berard Method (Ears Education and Retraining System), Samonas Sound Therapy, and The Listening Program (from Advanced Brain). Other Auditory Integration approaches include Tomatis. For information about it, and other controversial, but sometimes intuatively appealing treatments unsupported by 'the science' go to MUSEC Briefings on the Macquarie University website, and Procedures to Avoid from Quackwatch.